Various types of tower distributors are supplied in MONDI™ to meet your demanding requirements. 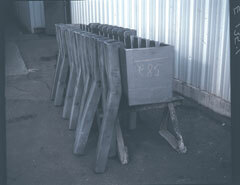 The distributors include troughs and downspouts, spargers and drilled pipes. MONDI™ troughs and downspouts are not subject to pluggage like pipe type or trough type with small diameter tubes. Our troughs and downspouts provide 15 plus years of reliable, maintenance-free service. MONDI™ and the tough sulfate film is resistant to weaker acid concentrations from process upset and shutdown conditions. Replacement parts or complete distributors are provided for your towers. If required, complete distributor systems can be assembled in the shop and match-marked to assure tower fit.